This task will track the installation, setup, and transition to our new (WMF owned) PDU towers in our racks in ulsfo. This work is scheduled for Tuesday, December 18th, at 11:00-12:00 Pacific. Please note that datacenter vendor policies do not allow customers to pull floor tiles to (de)energize PDU towers. All sub-floor work must be done by DigitalRealty engineers. Due to that, this will be a multi-step process. @faidon has suggested we instead do all the swaps of towers in a single scheduled work visit where I'm onsite with DR engineer. I'm fine with that, so I'll schedule the work with them once I confirm the right PDUs are onsite tomorrow. Please note the captive nuts for this arrived to my place today, and the brackets are on site. I can now start on this process of swapping the PDUS over. I'll go in next week and test fit the tower B in each cabinet. Ok, good news, the new PDUs will fit just fine in the racks, as long as we remove our cable managers. As one can see, the deeper 1U cable mangers are blocked from opening. So for now I'll just remove the fronts and leave them without front panels. We'll need to replace them with more shallow cable managers. I don't like how we have to leave the APC PDU unanchored in the rack when I install the Servertech, so I'm ONLY going to do pre-stage the tower B of each of these racks. This way there is only 1 unsecured PDU (and they wont have two unsecured PDUs banging into one another.) It is easy/fast enough to install the brackets now that I've done one of them to work out how to best arrange the brackets. So some bad news: I only ordered enough brackets for half the PDUs. T211632 has been created to order the other half. However, this will NOT block the migration to the new PDUs, I'll just temp affix the ST PDUs in place with zip ties rather than brackets. I can move them to brackets after the fact (when the new brackets arrive) with no downtime. Our two cabinets, X and Y each have redundant APC PDUs currently energized in each cabinet. Those APC PDUs are not Wikimedia property, but belong to Digital Realty and were loaned to Wikimedia until our ordered ServerTech PDUs order arrived on site. Those PDUs have arrived (and two of them are currently stored in Z). 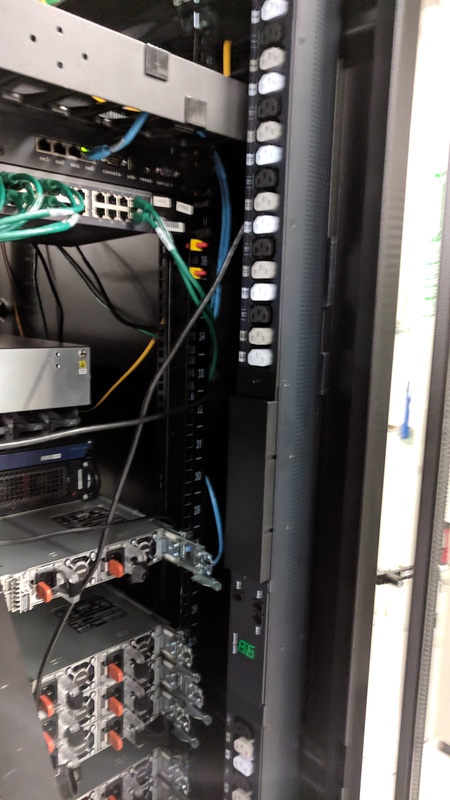 The other two are already installed into our racks, with the cables fed to the sub-floor, but have NOT been energized. 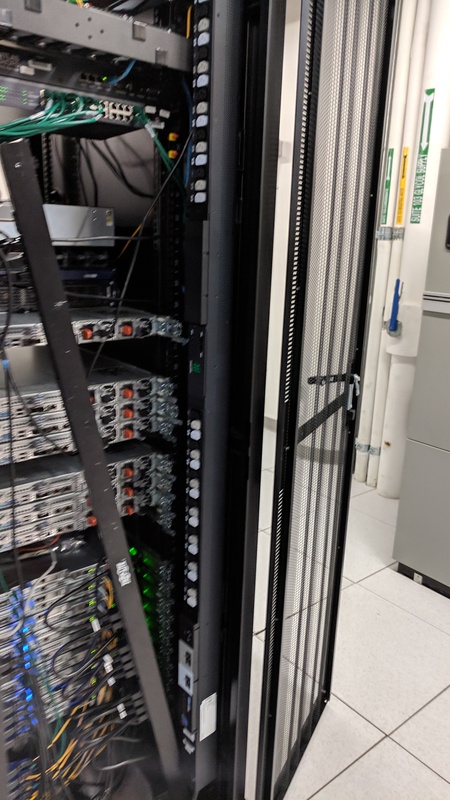 We need to schedule an on-site time for myself (Rob) to be onsite with Digital Realty engineer to de-energize the old APC towers, and energize the Wikimedia owned Servertech PDU towers. I'll need to move systems between towers as we migrate, as we should be able to do this without downtime. I expect this should take about an hour or less, as I'll just need the DR engineer to handle the unplugging/plugging in the PDU towers in the sub-floor, and I can handle the rest quickly. We'll energize the redundant feed tower in each cabinet, migrate to it, and then energize the primary feed in each cabinet. I am available to do this work from Wednesday & Thursday this week from 10:00-15:00, and then the following Monday-Thursday 10:00-15:00. (We prefer not to do any work like this on a Friday.) We prefer arriving at 11AM, as it avoids rush hour, but can shift to 10AM if needed! RobH added a subscriber: BBlack. @BBlack: This work is now scheduled for Tuesday, December 18th, at 11:00-12:00 Pacific. So either you can depool the site that AM, or I'll do so when I wake up (before heading into the datacenter.) I don't expect any issues, but since we're swapping entire PDU towers, it seems safer to do a preemptive depool. I have the codfw switch maintenance from 8am to 11am (where codfw will be depooled). And a dentist apt at 1pm. I think it's better to repool codfw before depooling ulsfo. I can take care of it. Thanks! I'll make sure to sync with Arzhel on Tuesday before starting the power work to ensure codfw is back online. I'm keeping this open to track the additional steps of adding the brackets to the ps1 in each cabinet (only ps2 has them presently) and also then auditing and labeling every power connection for remote port administration on the PDUs. Both PDU sets are online via mgmt interfaces and can be remotely administered. I'm getting the same error code on serial, will troubleshoot it remotely. Since mgmt network works, serial working is low priority. The ports still need audit (post bracket installation) and setup on the pdu software. all PDUs in ulsfo are now properly mounted. The temp/humidity leads are plugged in, but not run anywhere until AFTER we get rid of the decom systems and install blanking panels. Ok, while updating these, I've noticed that the power feeds in ulsfo are not balanced. Tower A is around 7 amps and tower B is around 2 amps for both racks. Ok, firmware updated and all power balanced.